Can I just say that time really does fly by faster the later in the year it gets. We found out we had to move house, traveled to Paris, packed our whole lives up, hosted a church retreat, a bridal shower and are now living in our new home. To say it has been stressful would be an insane understatement. I love all those things, but it has been a crazy month….one of the most manic I have experienced in years. More and more I am seeing the need to take care of my body and mind in the chaos and I wanted to share with you all today 3 ways I am coping with stress. When Dosha reached out to me this summer, I was hesitant but excited to try their at home acupressure mat. I had tried the acupressure head pillows before but was hopeful this newer trend in body care would work on my stressed out muscles. I have been using the mat at night before bed as a way to relax and rest my body. I have noticed my muscles relax but even more than that, it forces me to sort of meditate on how I am feeling which helps clear my head before sleep. I also love the mat because the women at Dosha designed it to also LOOK BEAUTIFUL. 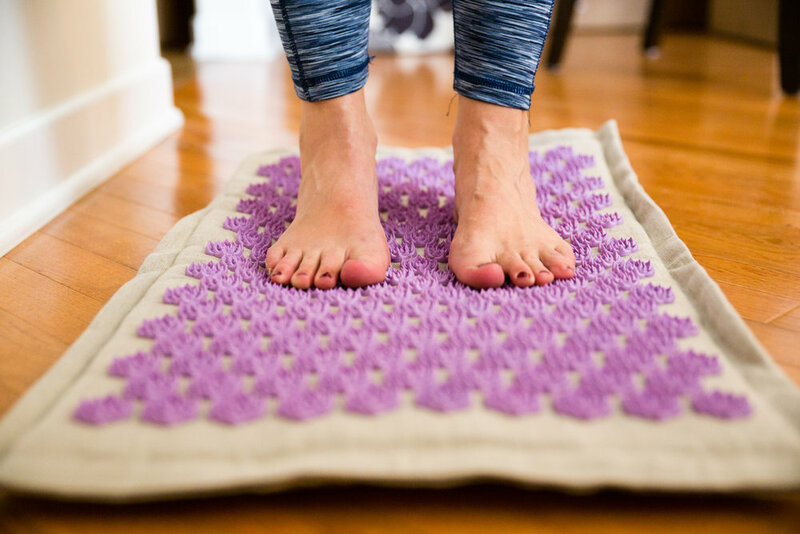 The eco-friendly and hypoallergenic linen fabric and lavender color palette make me WANT to use the mat. It also has this nice layer of padding which makes it more comfortable to lay or stand on. Acupressure mats help reduce muscle pain and stress, assist with sleep and even more. I can’t wait for more results as I continue to use the mat. Also, they have a promotion for 10% off the mat with the discount code TENOFF right now. Check out their acupressure mat! On the recommendation of my physician I have been trying deep breathing exercises 3 times a day. I struggle with chronic headaches and he recommended that getting more oxygen would help prevent the migraines. I have only been trying it for a couple of weeks but have noticed that I feel better generally - it also forced me to pause and calm down. Are you seeing the trend here? I decided that for the entire month of September I would give up an app, the app I spend most of my time in. I often lay in bed each night scrolling the Poshmark app for clothes and accessories as a way to slow my brain down and make me sleepy. Although I LOVE thrifting and shopping online, I often felt only frustration and jealousy over all the things I wanted but did not have. In attempt to both sleep better (ie no screens before bed) and trim out a cause of discontent, I gave up the app for the month. Although I had plenty of other stressers, I found I could not only fall asleep easier, but I was happier with my wardrobe and could see clearer the types of things I actually liked and wanted. How are you coping with stress lately?